Author: Holly Jacobs, Jennifer Drew Set In . . . 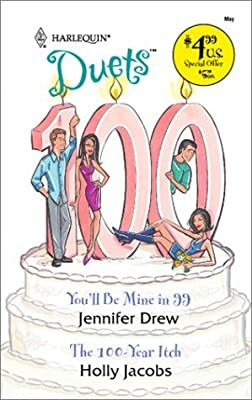 In Jennifer Drew's You'll Be Mine in 99, librarian Katy Sloane doesn't know what to do when she realizes Hiho, Ohio is actually celbrating its 99th, not 100th, birthday. Can she keep guest of honor, Joel Carter, from spilling the secret? Only if she slips into a bikini and enters the Miss Hiho contest! Meanwhile, the chase is on to discover Hiho's secret in Holly Jacobs' The 100-Year Itch. Will Zoe Wallace, festival chairperson, be able to foil intrepid reporter Mace Mason's quest for the truth? Sure, he's an out-of-towner, but with each minute he's not only closer to the secret he's closer to Zoe, as well. How will this crazy coupleever fall in love and save the day?